With its unusual theme of a woman martyr being crucified, this triptych includes a fine study of contrasting reactions among the crowd, and extensive imaginative imagery. 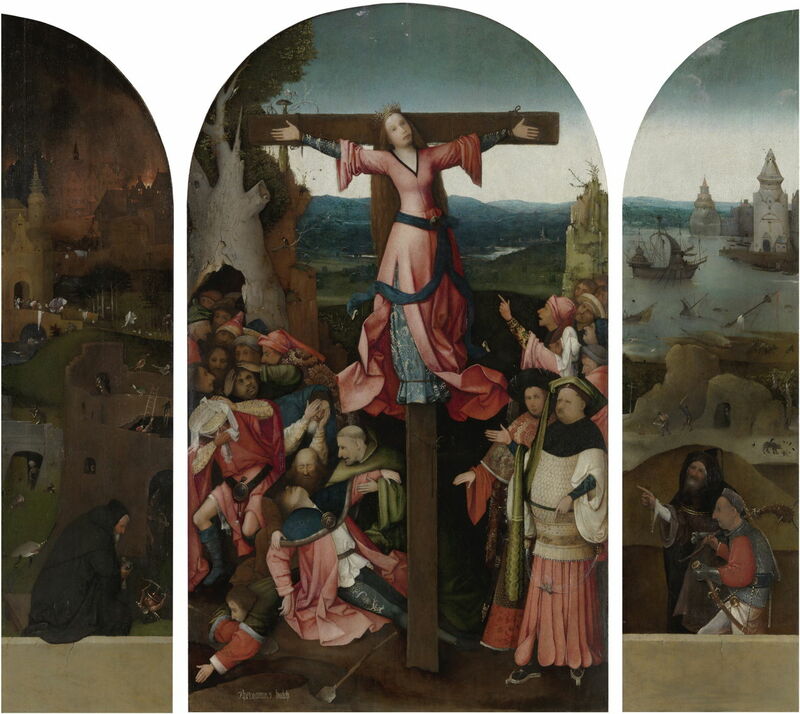 There are remarkably few triptychs whose central panel shows the crucifixion of a female martyr. Although there were ample female martyrs, they were almost invariably killed by beheading or other means. 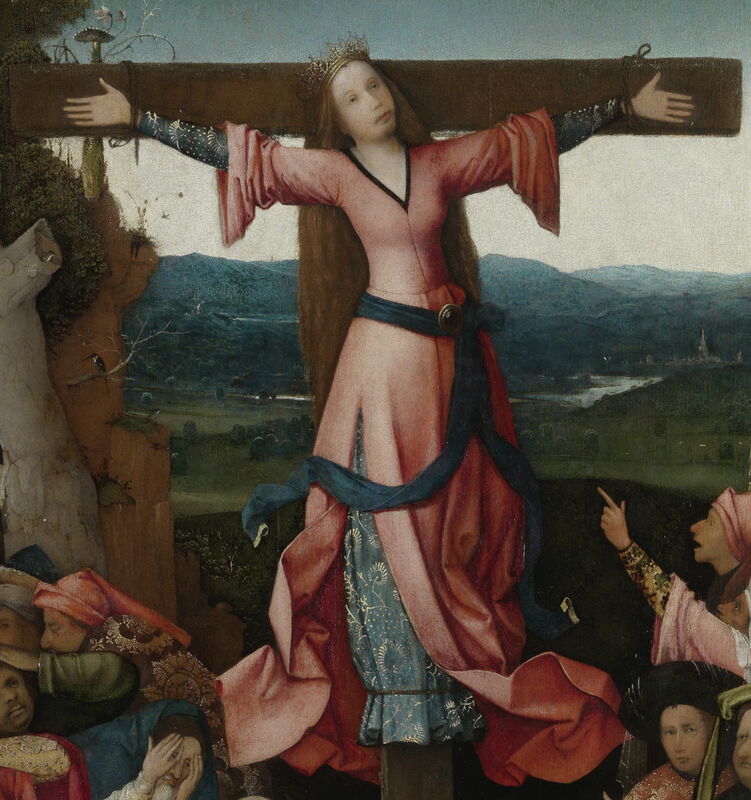 There are two possible identities which have been suggested for this painting: Saint Julia of Corsica, and a completely fictional ‘folk saint’ popular in the Middle Ages, known variously as Saint Wilgefortis, Uncumber, or Liberata. Saint Julia of Corsica is believed to have been martyred by crucifixion in about 439 CE, following various tortures and flogging. Some accounts claim that an inscription was present on the cross, others that a dove flew from her mouth at the moment of her death, but she has few established attributes beyond the palm of martyrdom and a separate crucifix. Her veneration is largely confined to southern Europe, and she is almost unheard of in the north. 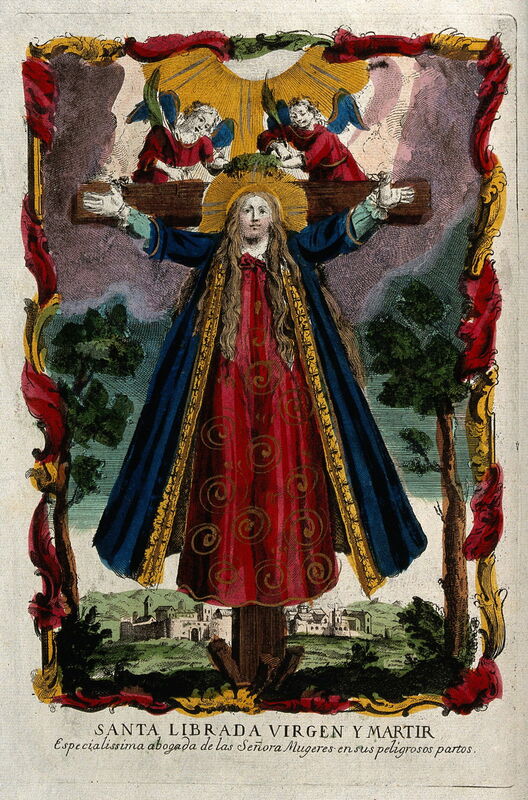 ‘Saint’ Wilgefortis, Uncumber, Liberata, Ontkommer (Dutch), or Kümmernis (German) appears to have arisen in legends from the 1300s, and her cult is now officially suppressed for want of evidence of her existence. She had apparently been promised in marriage to a pagan king, but had taken a vow of virginity. She prayed to be made repulsive to her fiancé, and as a result grew a beard. Most, but not all, of her representations show her being martyred by crucifixion and a clear black beard. 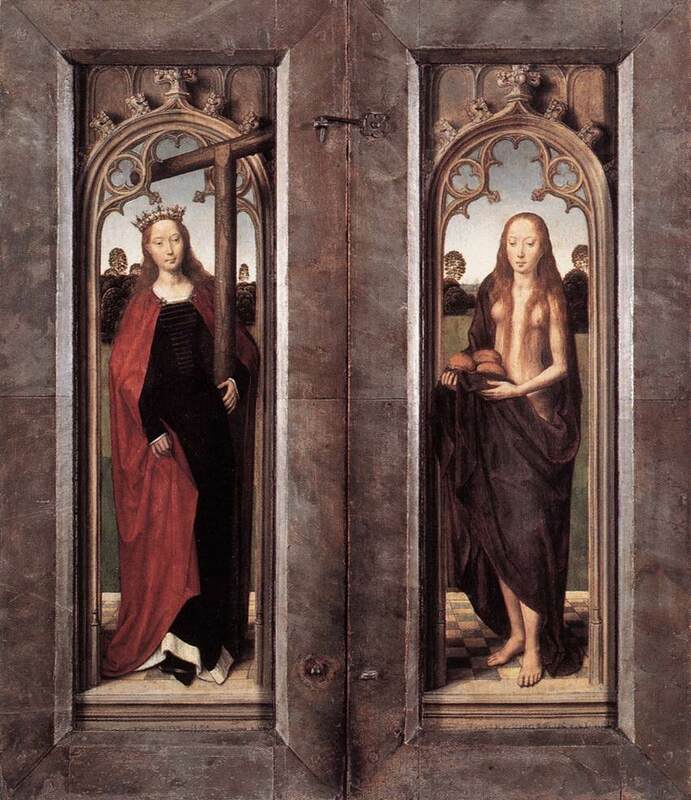 Hans Memling (circa 1433–1494), Triptych of Adriaan Reins, exterior, Saint Wilgefortis and Saint Mary of Egypt (1480), oil on oak panel, 45.3 x 30.6 cm, Hans Memlingmuseum, Brugge, Belgium. Wikimedia Commons. This exterior of a triptych by Memling shows her with, at most, a thin ‘five o’clock shadow’ rather than a bushy beard. Unknown, Saint Liberata (date not known), coloured etching, other details not known, The Wellcome Trust. Courtesy of The Wellcome Trust, via Wikimedia Commons. Some folk representations, such as this coloured engraving of unknown origin, also show her without a prominent beard. Images also may show a fiddler at the foot of her cross, and with one shoe missing. Hieronymus Bosch (c 1450–1516), Saint Wilgefortis Triptych (c 1495-1505), oil on oak panel, left wing 105.2 × 27.5 cm, central panel 105.2 × 62.7 cm, right wing 104.7 × 27.9 cm, Gallerie dell’Accademia, Venice. Photo Rik Klein Gotink and image processing Robert G. Erdmann for the Bosch Research and Conservation Project. 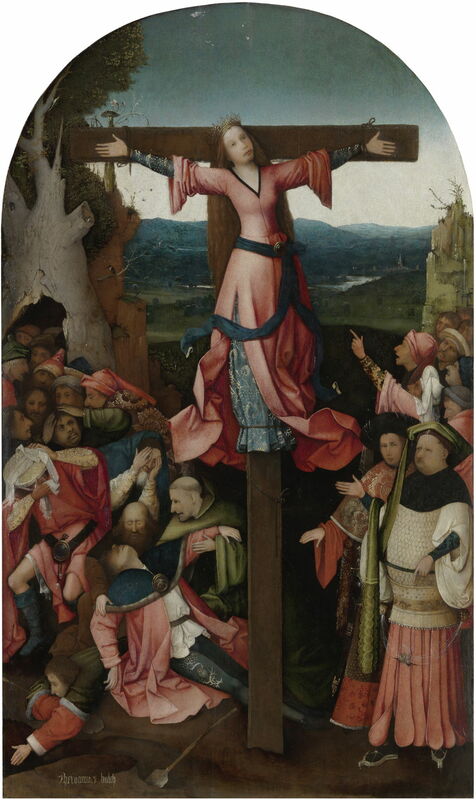 The triptych’s centre panel dominates, with its view of a woman – presumed to be ‘Saint’ Wilgefortis – being crucified on a ‘Tau’ cross, with a crowd divided in two at the foot. The left panel shows a man seated on a wall, overlooking a nighttime scene of fire and distress. The right panel shows two figures in front of a coastal landscape with ships. The left panel has a rendered wall at its foot. Seated on the wall is a man dressed in black robes with a hood. His hair and beard are white, and he leans slightly forward, looking to the right and down, at a strange portmanteau creature below him. He holds what appears to be a goblet and a small bell in his hands. Behind him is a partly-ruined tower, in which there are men, birds, and stranger creatures. To the left of that is a bridge, with various figures and creatures around it. In the middle distance is a fortified gatehouse, leading to a bridge. There is a procession of people bearing loads of clothes and other goods across the bridge and along the road over to the right edge. Behind that, in the distance, is a town which has buildings on fire. They light this night scene, and smoke rises from the area. The impression is of threat, distress, and danger. 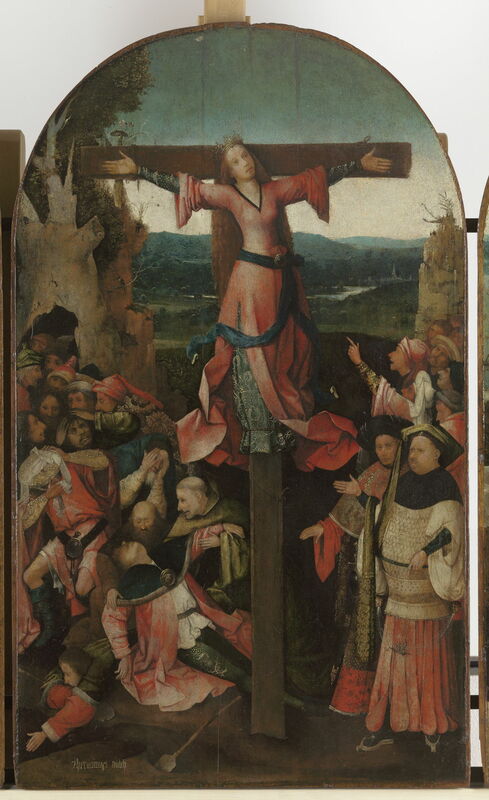 The centre panel is dominated by a woman tied to a ‘Tau’ crucifix, positioned slightly to the right of centre, so that the location of her feet (which are not visible) is at the centre of the panel. She looks young, and has very long mid-brown hair extending down her back to below her waist. She wears a dark blue undergarment decorated with a distinctive tree-based pattern in silver. Over that she has a long red dress: its wide-open sleeves have fallen back to ruck up at her elbows. The dress has a modest V neck, and is split below the waist. Over that she has a fabric waist tie, fastened with a brooch, which dangles loose ends. She is tied at each wrist and over her clothing at her feet, to a finished wooden cross. The palms of her hands face the viewer, and have not been nailed. She has a slightly sad, plaintive expression and looks up and to the right. At the foot of the cross, on the right, is a party of nine men who appear hostile towards the martyr. One points at her with his left index finger and is talking to or shouting at her. On the left, a party of about fourteen men appears to have emerged from the hollow trunk of a large old tree. At the front is another man in a faint. His feet are still to the right of the foot of the cross, but he has fallen to the left. His head is thrown back, and two men appear to be trying to support and revive him. Others in the group on the left appear distressed and upset by the crucifixion. In the left middle distance is a small rock cliff, at the top of which is a strange plant which has a rounded fungal cap and flowers. At the right edge are the ruins of an old tower, now overgrown with other strange plants. The far distance shows a river plain leading to a town, set amid green rolling countryside with woods and forests. The right panel has a rendered wall at its foot. Behind that are two men walking from right to left. The closer appears to be an executioner. He carries a curious spiked club or shillelagh over his right shoulder, and a curved sword in a sheath on his left side. The more distant man wears dark brown robes, and is pointing with his right index finger towards the crucifixion on the centre panel. Behind them is a rocky area in which one figure is trying to spear a small mammal, and another figure behind is swinging a large sword as if to kill the hunter. A wolf is stood by the remains of another animal, and is surrounded by crows. A figure is suspended from the leafy branch of a tree above. Beyond is a small beach, on which a group of about 8-10 people are dragging a large whale using rope. In the water beyond there is a wreck, with the bows and mast still standing clear of the water surface. The remains of a sail are draped over the mast, and a long red pendant hangs limply from the top of the mast. The harbour behind is formed from towers and other buildings. A strange ship with a curved tower aft of its fo’c’sle and large jaws is being rowed across the harbour. Various smaller vessels are also visible. The far distance is of rolling green countryside similar to that seen in the middle panel. The impression is of unease, but no immediate threat or danger. The centre panel uses a conventional if not formal approach to the crucifixion, but instead of featuring donors and saints at its foot, presents two opposing parties: those on the right clearly instigating and supporting the execution, those on the left opposing it. Between them, having been stood on the right but falling over to the left, is the figure of the woman’s fiancé, as if he wanted her killed and has now – in his emotional state – changed sides. The two side panels are unusual, in that they do not show events prior to or after that of the central panel, nor other saints. Originally they contained large figures believed to have been of the donors, but were overpainted early on. This is discussed below. Once overpainted, the function of those side panels appears oddly limited. It is possible that the foreground figure in the left panel is intended to represent a saint, but there are few clues as to who it might be. The landscapes shown in the three panels may have been drawn from the same general source, but they are not continuous, and in any case the left panel is set at night. This further questions their purpose in the triptych after the donors had been painted out. 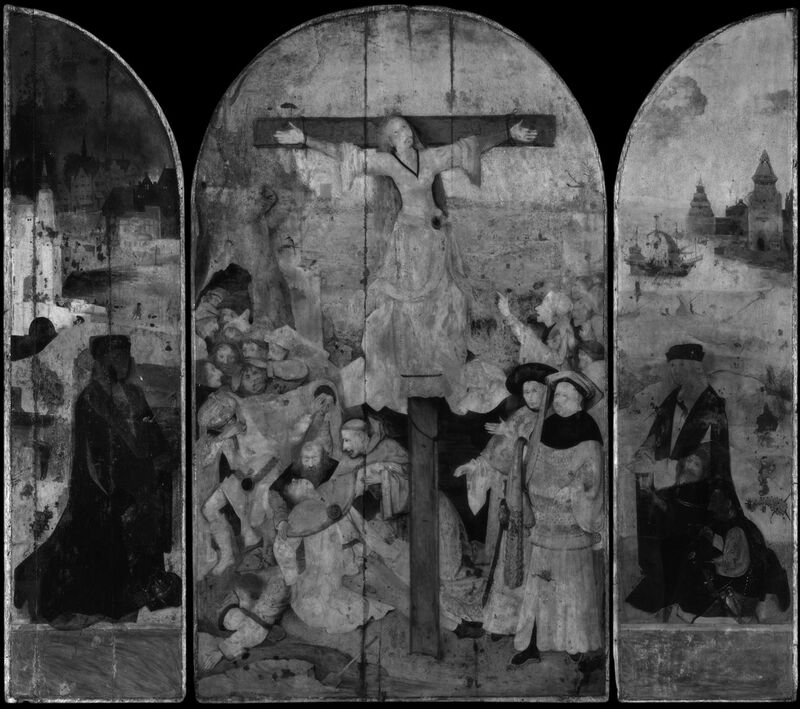 The two side panels have more of Bosch’s idiosyncratic beasts and vignettes than the centre panel, which focusses on the crucifixion scene. 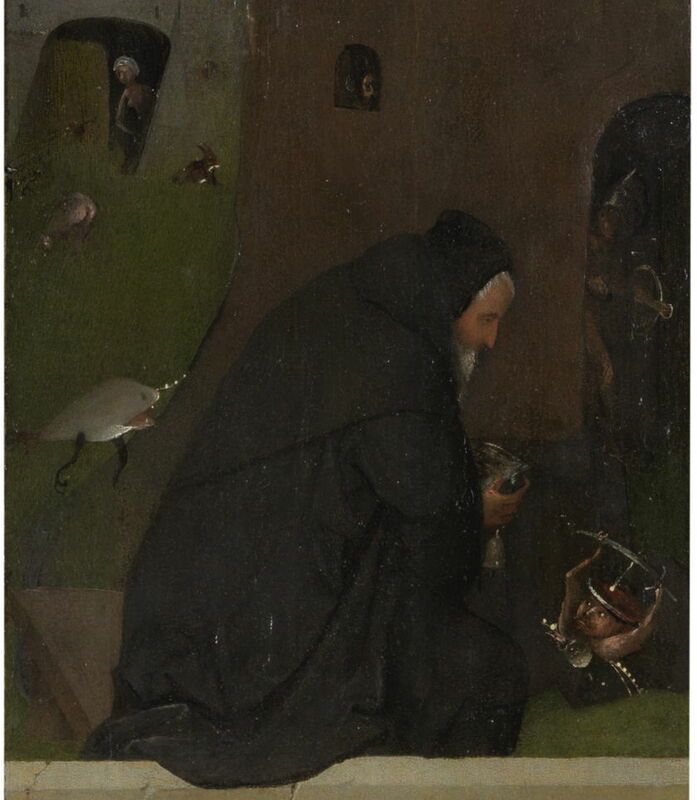 The figure at the foot of the left panel has some visual similarity with Saint Anthony in the Hermit Saints triptych, and appears to be holding a small bell, one of the attributes of that saint. That panel also features fire, another of his attributes. The strange creature by him seems to consist of a head, wearing a silver-rimmed hat, arms bearing a crossbow, and little else. Another crossbowman is visible in the entrance to the tower behind. To the left is a narwhal with black legs, a pair of naked buttocks, and a hare. ‘Saint’ Wilgefortis, if it is her, has slight facial hair, which Ilsink et al. claim was more prominent when first painted. It does not, though, amount to the florid black beard seen on many depictions of the ‘saint’. She wears a crown (not a crown of thorns), which is typical of Wilgefortis, and her undergarments are distinctive and unusual, perhaps those which might have been worn for marriage. This detail also shows the strange plant at the top right, with its fungal cap and flowers, and the landscape background. 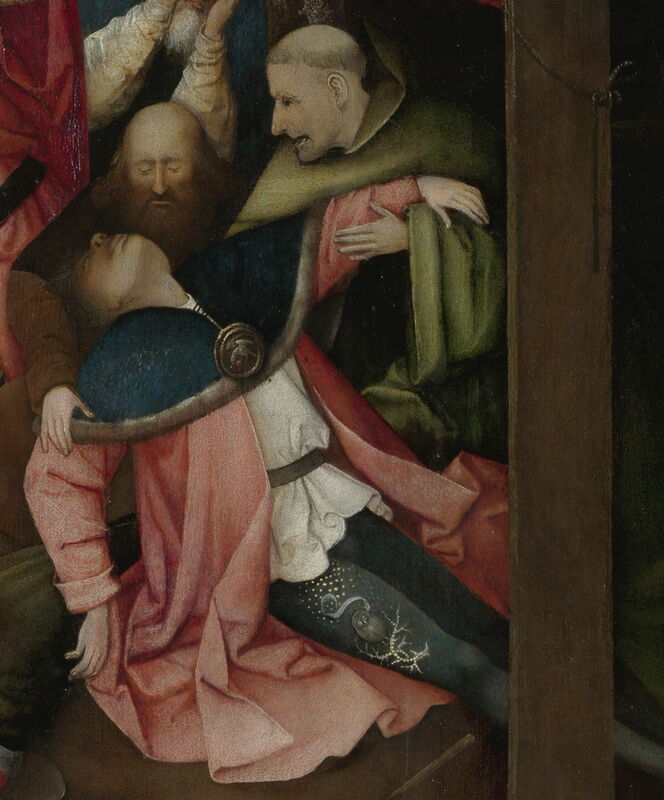 The old, bald and bearded man behind the fainted fiancé, at the foot of the cross, is similar in appearance to Bosch’s Saint John the Baptist, or the man in the red robe (who might be Saint Peter) in both his paintings of Christ Carrying the Cross. The monk to the right resembles Saint Giles, in the right panel of the Hermit Saints triptych. A closer view of the fiancé’s tights show their similarity to the undergarments of ‘Saint’ Wilgefortis. The owl – the only instance of an owl in these three panels – has been embroidered on, and has a text scroll above it, which may originally have borne an inscription. Most commentators have claimed that the owl is symbolic of the negative, such as ignorance or evil, but there is no evidence as to that meaning here. As it is close to Bosch’s signature on the panel, it may be nothing more than his graphical signature, as used in so many of his paintings. The two men in the foreground of the right panel appear to have little purpose in themselves, and may serve simply to direct the viewer towards the centre panel. The cudgel carried by the executioner is thoroughly nasty. 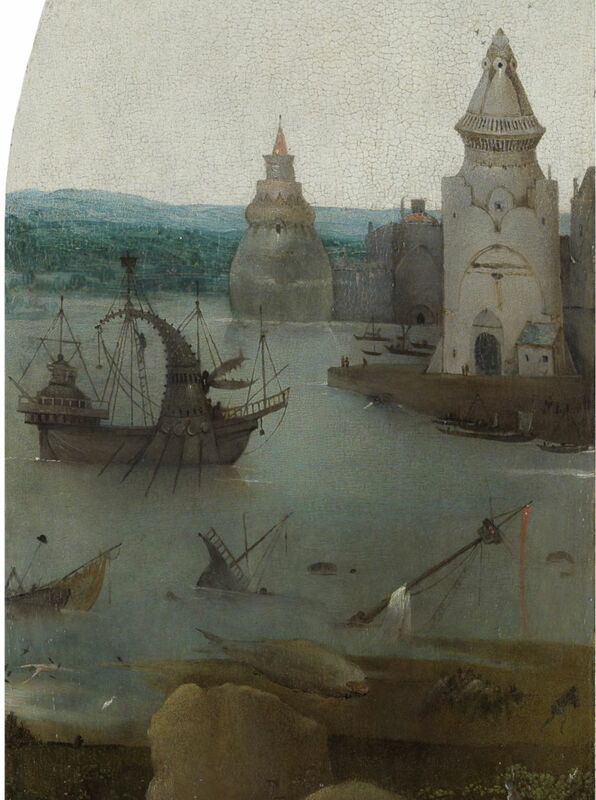 This detail shows the strange events and objects in the harbour in the background of the right panel. It is tempting to suggest that collision with the whale may have been the cause of the sunken ship coming to grief. The peculiar form of the ship under way, being rowed, is even more apparent. This triptych has been relatively little-studied, and there remain some major uncertainties, not least of which is the identity of the central figure: ‘Saint’ Wilgefortis, Saint Julia, or some other Christian martyr. For the moment the evidence points most strongly in favour of ‘Saint’ Wilgefortis, but the issue is by no means settled yet. The next issue is explaining how the two side panels form a coherent whole with the centre. In their original configuration, with large images of the two donors, their further purpose or reading seems obscure. 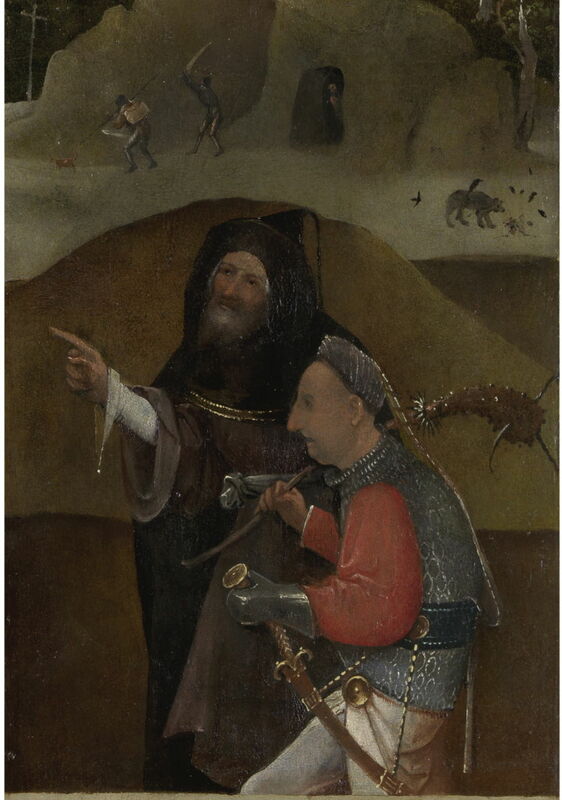 They do not have any coherent biblical or saintly references: it is likely that the left panel now refers to Saint Anthony, and possibly to a historical fire, such as that which almost destroyed Bosch’s home town of ‘s-Hertogenbosch when he was a boy. The only religious reference which might be hidden in the right panel is to the story of Jonah and the whale, but the panel does not seem to relate to that in any way. It too might link to local history. Soon after 1000 CE, whaling was conducted in European waters mainly by Basques, but English, Dutch and Danish whalers were well established by about 1600. When it was still a thriving port during the 1400s, Bruges saw considerable trade with the Basque country, which may have included whales caught in the North Sea. I think it most likely that the original intention had been to show the two donors on the side panels with scenes related to their origins and local history. When the donors were overpainted, Saint Anthony was added and those links became obscured, and the whole triptych more difficult to read. Hieronymus Bosch (c 1450–1516), Saint Wilgefortis Triptych (infra-red reflectogram) (c 1495-1505), oil on oak panel, left wing 105.2 × 27.5 cm, central panel 105.2 × 62.7 cm, right wing 104.7 × 27.9 cm, Gallerie dell’Accademia, Venice. Photo Rik Klein Gotink and image processing Robert G. Erdmann for the Bosch Research and Conservation Project, via Wikimedia Commons. What we see today is quite different from its appearance when it was first completed. As revealed in the infra-red reflectogram above, the two side panels originally had larger full-length portraits, presumably of the two donors. 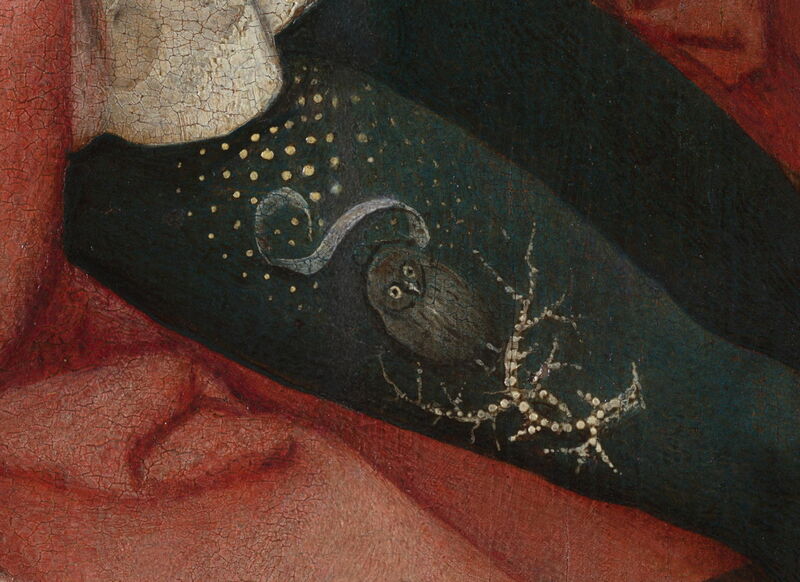 They were overpainted, either before the triptych left Bosch’s workshop, or soon afterwards. Ilsink et al. consider that the quality of the overpainting is such that it is most likely to have been performed in Bosch’s workshop, and much of it probably by Bosch himself. It is also likely that the exterior of the triptych originally had grisaille paintings on it which were shown when the triptych was closed. These are thought to have been removed when the work was in Vienna between 1838 and 1919. Hieronymus Bosch (c 1450–1516), Saint Wilgefortis Triptych (centre panel, before conservation) (c 1495-1505), oil on oak panel, left wing 105.2 × 27.5 cm, central panel 105.2 × 62.7 cm, right wing 104.7 × 27.9 cm, Gallerie dell’Accademia, Venice. Photo Rik Klein Gotink and image processing Robert G. Erdmann for the Bosch Research and Conservation Project. The triptych has recently benefited from extensive conservation work performed by the BRCP from 2013-2015. This can be seen in the image above, which shows the centre panel prior to that work being undertaken. Wikipedia on Saint Julia of Corsica. Matthijs Ilsink, Jos Koldeweij et al. (2016) pp 188-197 in Hieronymus Bosch, Painter and Draughtsman: Catalogue Raisonné, Yale UP and Mercatorfonds. ISBN 978 0 300 22014 8. Posted in General, Painting and tagged Bosch, Memling, painting. Bookmark the permalink.